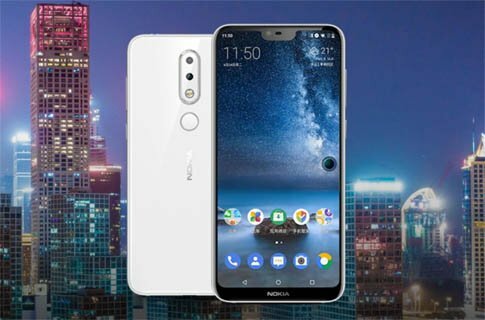 Under the mid-range affordable price Nokia 6.1 Plus is launched with bezel-free screen known as infinity display and featuring Android 8.1 (Oreo) OS, 5.8 inches IPS LCD capacitive touchscreen, Snapdragon 636 processor, Dual 16+5MP Primary | 16 MP secondary camera, 32/64 GB Internal | 256 GB External card | 4/6 GB RAM and 3060 mAh battery. Double-sided glass body with 2.5D Corning Gorilla screen fused with aluminum alloy metal frame maintaining a premium classy design feels very compact and glamorous in hand. You can find the volume buttons and power keys on the right edge of the phone. The bottom has a Type C USB slot and speaker with a decent sound. 5.8-inch FHD+ full screen offers an immersive experience of watching visual content like movies, TV shows etc. Rear 16+5 MP dual sensor camera has high sensitivity to the depth of field and captures excellent clear imaging. for the selfies, the front 16MP camera takes fine and clear quality, more realistic photos. HDR (high dynamic range image processing technology) achieves the high-quality depth of field. The camera also featuring EIS (video anti-shake technology) with enhanced image and color contrast so you can record shake free quality videos. Intelligent facial recognition, dynamic stickers can accurately “track” your facial expressions, create unique dual-view videos or photos, take pictures with great fun. Premium built quality with premium design. Camera quality is quite good and supporting EIS. Dual VoLTE HD call, faster connection speed, better call quality, Internet access while talking. The waterproof feature is not available. No flashlight for the front camera. Li-Ion 3060 mAh Non-removable battery.